This wouldn’t be the first time, but check out what John Stewart has to say on the recent blowup surrounding Common coming to the White House. What other song could be hotter? A classic from my hey day. This guy’s intro shouting out to Tupac and other American’s rappers is funny, too. I am still slippin’ with this. Kanye West, Common, Big Sean, Pusha T, DJ Premier. Lead single off the blink-182 skin slapper’s solo debut, Give the Drummer Some, which drops later this year. Click on the image to view the full size. I had to minimize its size to fit the page. 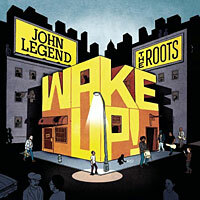 NPR provides here a full stream of the new album between John Legend and the Roots. It sounds awesome! By Airwave Ranger. I wonder if Dre took note from this video. New single by Kanye West titled Power. The Roots’ experimental adventurousness has earned them love from rock critics, they are a hip-hop band at the core, and the most effective collaborations on How I Got Over are with the rap and R&B names that might be new to some listeners. The sieze-the-moment groover “Now Or Never” has a tremendous showing from Phonte, an MC from Durham, NC crew Little Brother, and “Web 20/20” spotlights Peddi Peddi from Philly underground group State Property. How I Got Over could be how The Roots themselves got over the brooding lyrical frustration of Rising Down and Game Theory, how they got over the disappointments of a rap game that rewards instant celebrity rather than artistic longevity. It’s about how they got their groove back and proved they remain catchy, inspiring and sonically relevant, two decades and some into their career. I am previewing this now on iTunes. It may be calling my name to purchase it! Beyond all of the tracks on this album that you have heard at least 400 times, the whole CD is off the chain!